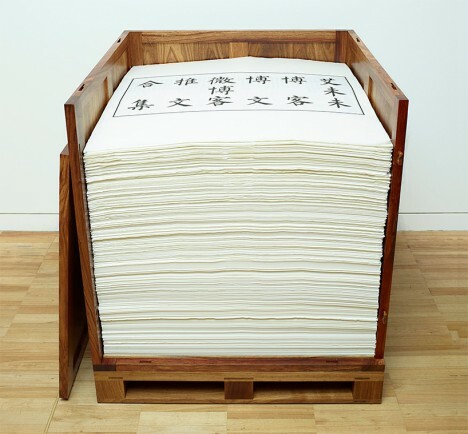 China has incarcerated him, put him on house arrest and made every attempt to shut artist and activist Ai Weiwei up, but they haven’t stopped him from expressing his scathing criticism of the country’s rapid industrialization and cultural oppression at every turn. 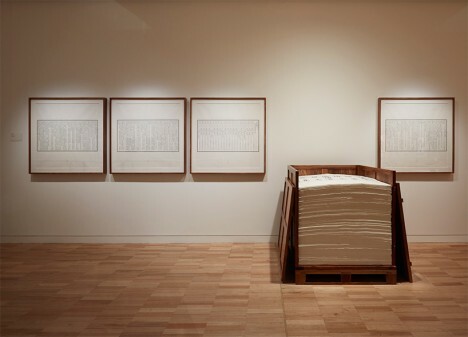 Known for investigating government corruption and cover-ups, Weiwei was arrested on highly questionable tax evasion charges and held in a tiny, constantly-lit room overseen by two guards around the clock, and wasn’t allowed to leave the country for a year after his release. 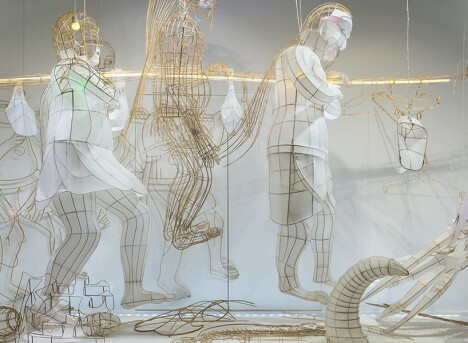 He remains under heavy surveillance, and his moments are restricted, but through his art installations around the world, he’s still able to express the views Chinese officials find so threatening. 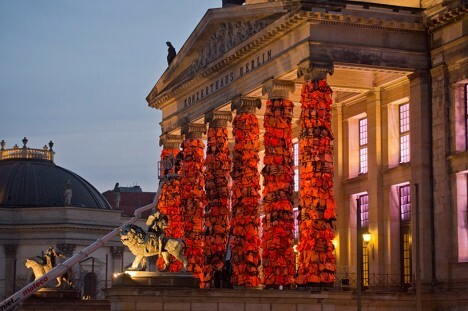 Here are 10 of Weiwei’s most striking projects addressing everything from the current refugee crisis to the ‘Made in China’ phenomenon. 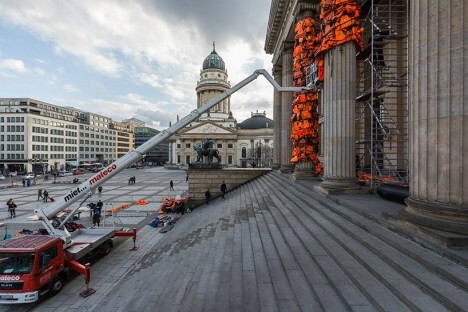 Life jackets left behind by refugees when they reach the shores of the Greek island of Lesvos adorn the columns of Berlin’s landmark Konzerthaus in a poignant installation completed on February 15th, 2016. 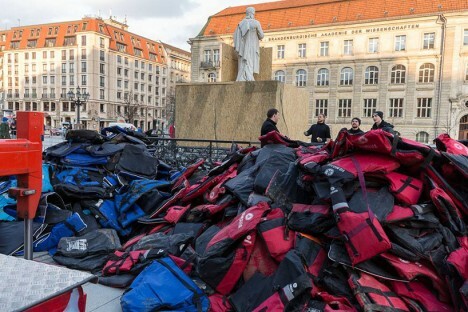 Weiwei retrieved the jackets himself and in doing so, was present as even more refugees landed. 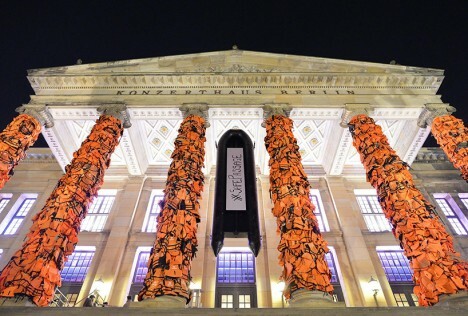 Drawing attention to the humanitarian crisis, the project provides a striking visual representation of the scale of the problem, with the 14,000 jackets standing out in safety orange. 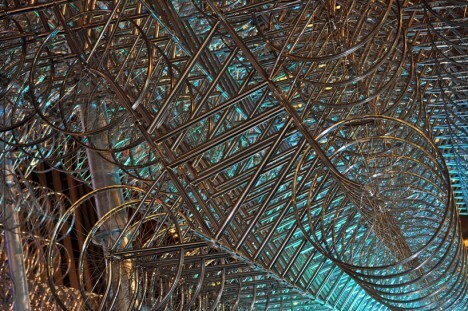 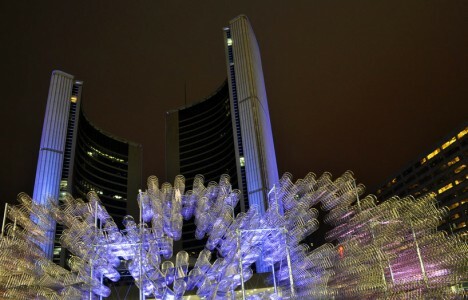 3,144 interconnected bicycles come together into one big 3D structure in Toronto’s Nathan Phillips Square in this reinterpretation of Weiwei’s ‘Forever Bicycles’ exhibition. 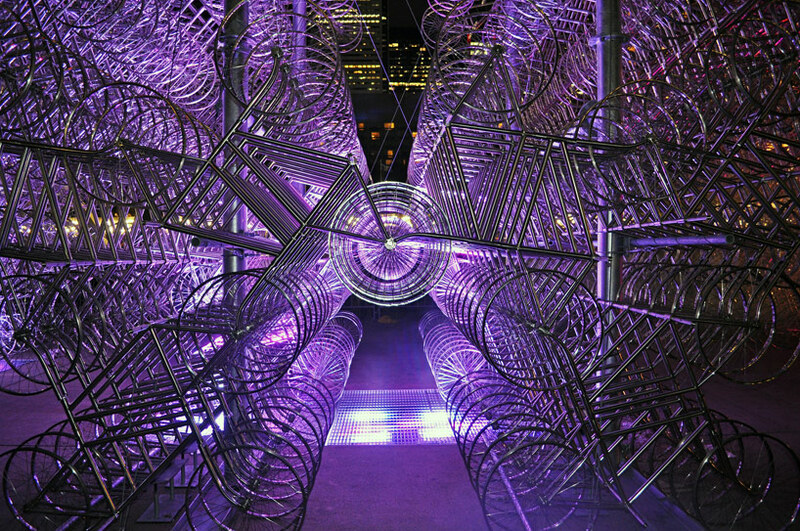 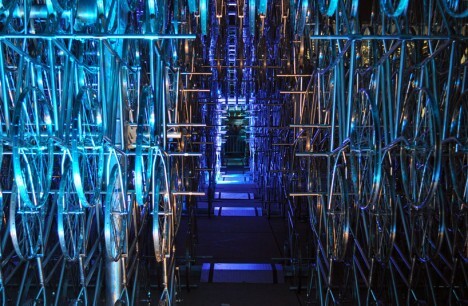 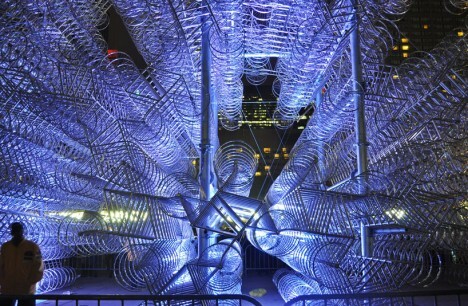 Presented by Scotiabank’s Nuit Blanche in 2013, the sculpture is made of frames from China’s biggest bicycle brand, and represents the rapid changes that are taking place in the nation and across the world. 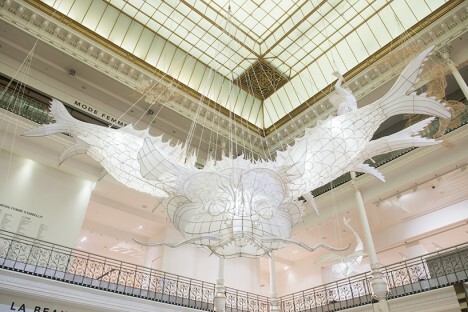 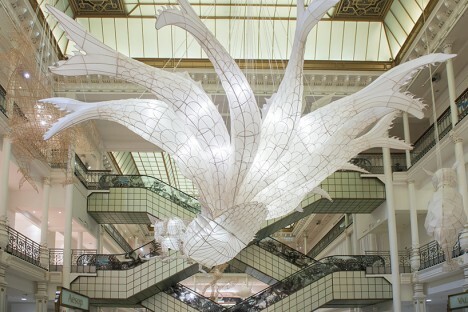 Figures from Chinese mythology blend with symbolism from Ai Weiwei’s own portfolio in ‘Er Xi’ (Child’s Play), a serene exhibition of three-dimensional white silk and bamboo sculptures at Paris’ Le Bon Marché department store. 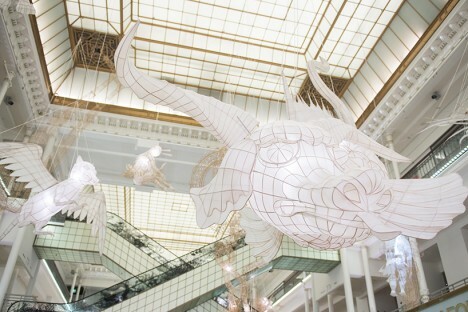 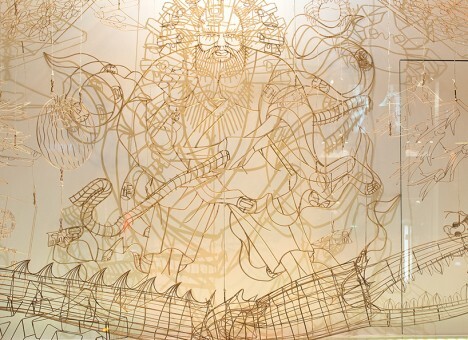 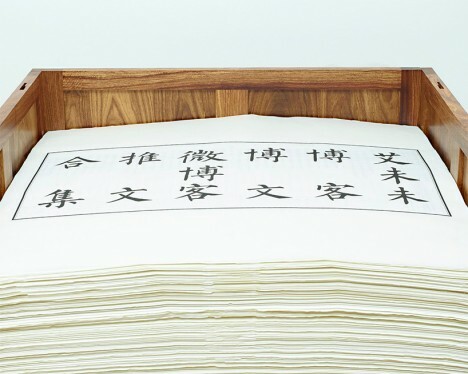 The display combines 2,000-year-old tales told to Chinese children with the kite making tradition, presenting the narratives in the front store windows and continuing them in the atrium with interpretations of Shan Hai Jing woodcuts.